PAYNESTAR is making waves with his latest capsule drop entitled “HOUSE OF STARS”. This artist has been gaining steady momentum with each online post, and is sure to take over as a result of his fascinating creations. With a colorful all over print featuring various nods to Walt Disney and creative uses off trademark and copyright symbols, Paynestar continues to break into this ever-changing space of streetwear with some very eye catching pieces. Those who are fashionably-savvy know that garments of this quality are not easy to come by, so make sure you head on over to the PAYNESTAR shop and pick something up! Los Angeles’ Cutthroat returns to the forefront to unveil their fresh new Spring/Summer ‘19 capsule. The new collection features a plethora of hard new pieces including faded tees, hoodies, hats, sweatpants, as well as hooded flannels. Directed by designer Unathletic, this new collection is surely not one to sleep on. Head over to the Cutthroat online shop here to purchase your favorite items. Terror Tales has been doing their thing since last March with various releases, but now owner Jamie Heuer is ready to take it to the next level as he releases his debut collection: World of Terror. 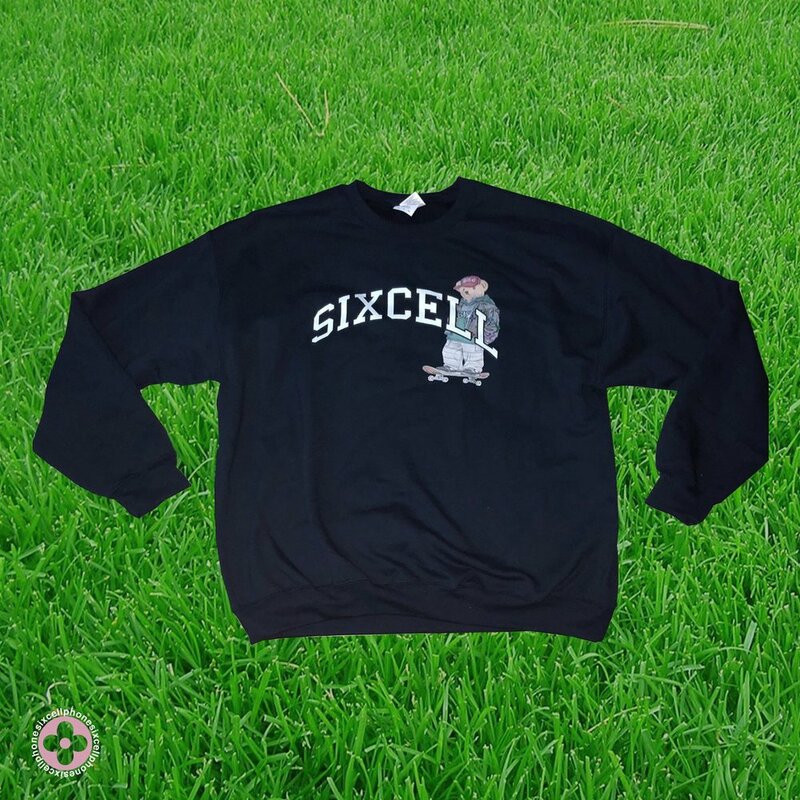 Featuring 6 unique pieces including a mushroom patterned Hawaiian shirt (that i’m a huge fan of), embroidered rugby, and an assortment of hoodies. If you’re interested in purchasing any of these dope garments click here to see their full World of Terror collection. The highly-praised streetwear brand ABSENT reveals their upcoming collection & admits to their supporters that they are in fact utterly insane. Consisting of an all over screen printed tee, heavyweight chain logo hoodie & a front/back logo tee, the boys PARKER, UNATHLETIC & AUGST have done it again as they out do themselves for another legendary collection. Be prepared to have your credit cards ready when this becomes available to the masses as it will for sure go fast! JAKE HAYES a.k.a SIXCELLPHONES is a creative standout reigning from Southern California who you immediately need to get familiar with. Slowly but surely building his portfolio ranging from graphic designs to now clothing, JAKE is unquestionably a spewing mastermind at the work he shares from his social medias. 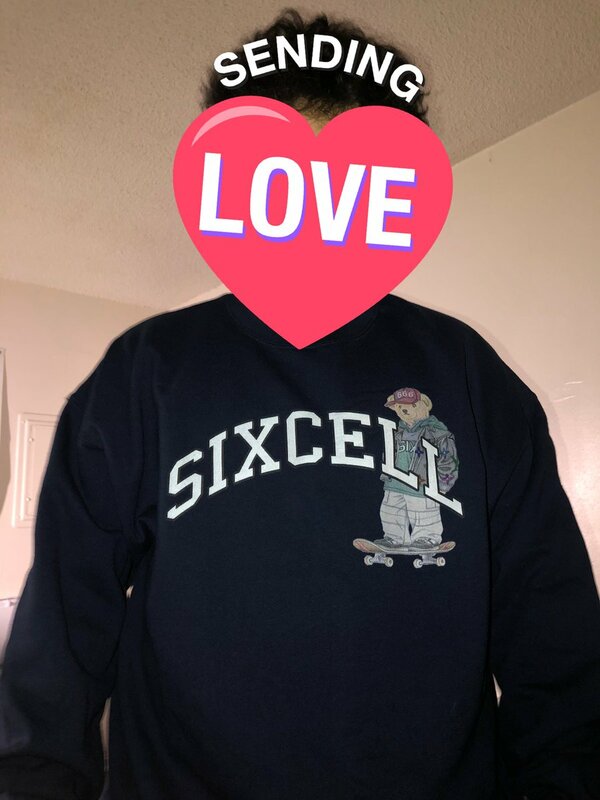 Taking a jab at clothing for the first time, SIXCELLPHONES incorporates his unique name to multiple styles of garments like, t-shirts, long sleeves & a hoodie. Giving his supporters a release date of 12/14/2018, JAKE launches the must-see lookbook for his upcoming “F/W 2018” capsule below! Today I had the chance to speak with a familiar face in North Carolina’s buzzing fashion scene. Jack Broadnax is someone you need to keep an eye on. Partnering with Wilhelmina Models in New York, Jack has been making his way. He’s even been featured in shoots for Social Status and Paper Magazine. Although his modeling career is blossoming, he still has another passion. The founder of Her Children, Jack has now branched out onto another leg of his journey. Good People New York is his latest endeavor and he’s releasing his first garment today! The thick cotton crewneck is perfect for the upcoming winter season and features a quote that many should live by. 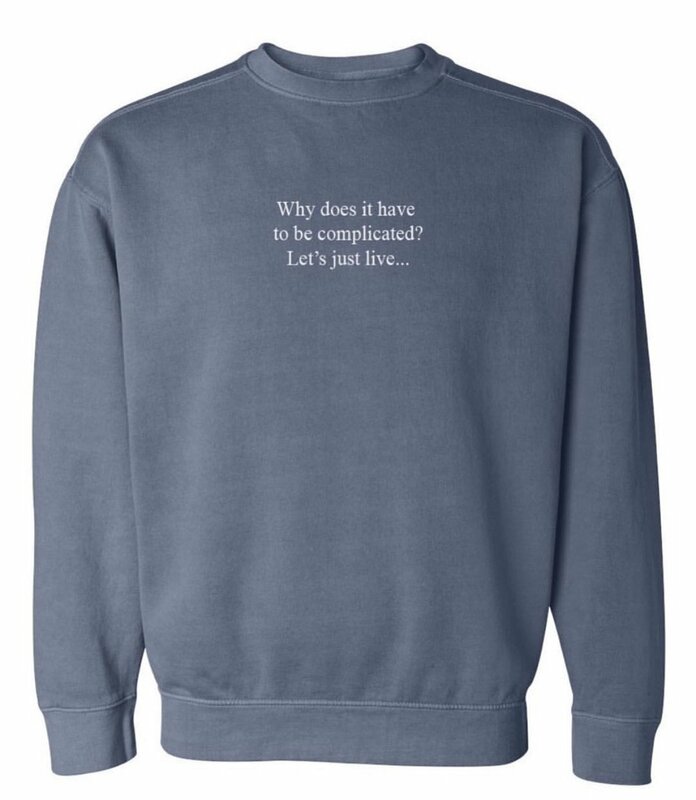 If you’re interested in purchasing this sweatshirt click the link here to see his official webstore! Gastonia, North Carolina Vs. The World! 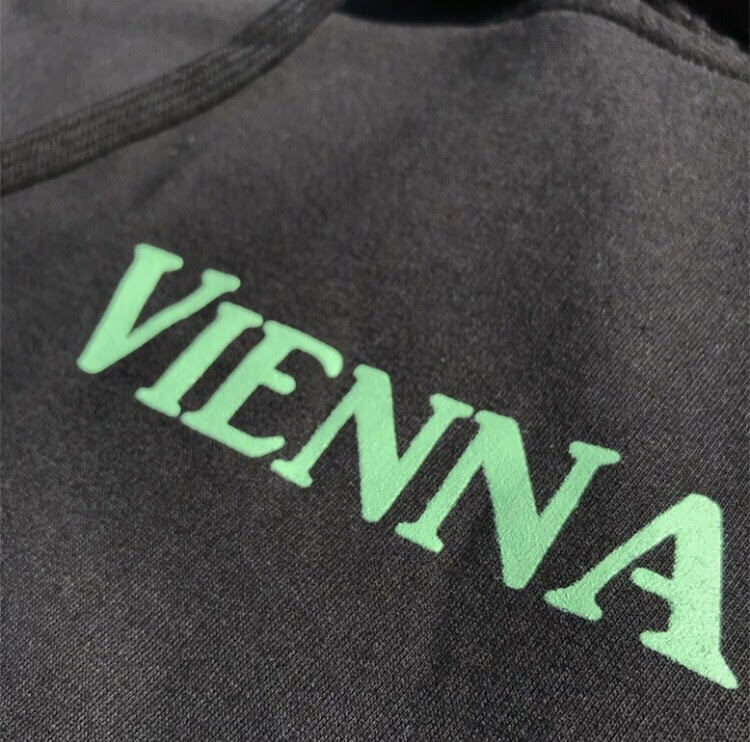 Gastonia, North Carolina based brand VIENNA are quickly certifying themselves as a force to be reckoned with in streetwear. Offering a fresh take to the often bare market of streetwear brands in our home state, their dark outlook on flavorful pieces like the “Not In My Right Mind” tee, to their past “Harm Makes Harmony” release, Vienna is sure to be a contender for the next anti-establishment brand to break into the spotlight. Visit their online store here and see for yourself why Vienna will be everywhere soon enough. Starting their business by repurposing trousers and crafting them to fit a plethora of unique styles from tactical to casual, Fine Britches is quickly becoming one of North Carolina’s premiere brands. Keller Harrison and Jahzar Joseph are the masterminds behind this whole operation. Starting with only a sewing machine, a pair of pants, and assorted fabrics, pockets, buttons, etc. these two have already released an entire collection of pants ranging from Kill Bill style color-blocking to new age military. Already gaining attention from underground powerhouses Coldhart, 10cellphones, Saucy Longwe, Slime Dollaz, Kodie Shane, and many more these two are pushing the boundaries in the realm of do-it-yourself fashion. Operating for less than a years time, these two have already branched out to more and more cut and sewn garments such as hoodies, vests, and shirts. The sky is really the limit for this dynamic duo and I can’t wait to see what else they have up their sleeves. With The Bazaar At The Palmer Runway Show taking place on October 30th fans and fashion lovers alike will be able to get a sneak peek into their latest capsule with Jared Soule. Give them a follow on Instagram and Twitter @finebritches to keep up with their ever-changing wardrobe of new pieces and make sure you pop out October 30th. Los Angeles based brand H33M have unveiled a fire new lookbook for their “FALLOUT PART ONE” collection. This installment features a wicked assortment of collar-bearing long sleeves, coach jackets, hoodies, and sweaters alike. Photographed by ANNEKA BUNNAG, with help from stylist JESSICA HARRIS, the variety of pieces are also modeled by JON PONTIAC, EYEKEEM, and JAKOBI MCLEMORE. Absent + CLEAN Vs. The World! Surely rising to the forefront of streetwear, ABSENT has established itself as one of the future staples in recent months. Teasing at an upcoming collaboration through social media, Absent + CLEAN have unveiled their insanely-hard new capsule which features black and white graphic hoodies, along with long sleeve shirts to match. Buyers can expect to purchase on October 11th. You can follow both parties for more details. RYDER STUDIOS have delivered their newest contribution to the buzzing brand with new “Cowboy Club” hoodies. Being a widely popular series from the brand, the Cowboy Club logo is featured on black and white pullover hoodies with a bandanna sleeve. Buyers can expect to purchase September 14th on JEBIDIYAHRYDER.COM. Absent + Unathletic Vs. The World! Combining efforts, ABSENTCLOTHING + UNATHLETIC are set to release their collaboration collection October 1st. This collection includes rhinestone hoodies, fitted hats, and sandals as well. The most exclusive of the items, the sandals will only have 10 pairs available upon release. You can expect to purchase on the Absent website. Fani + Felt Vs. The World! Gearing up for their September release, ORIGINAL FANI + FELT are poised for one of the most high-profile collaborations of the year. The infamous "Fandana," from Original Fani, is about to get the magic touch of Kristian Acosta to provide a high-end yellow Felt design with the patented butterfly pattern. I'm expecting this release will sell out almost instantly. You can expect to purchase on the Original Fani website. Utah + Charlotte Vs. The World! August 5th, @ABSENTCLOTHING will be collaborating with Charlotte's top gun 10CELLPHONES for an extremely rare capsule collection. The collection features black and white hoodies with Absent/10Cellphones insignia's, + long/short sleeve shirts with a hard 10Cellphones design behind the scenes. You can expect to purchase on ABSENTUSA.COM. Phoenix, Arizona Versus The World! Behind-the-scenes are where the real moves are being made, this is accurately justifiable in an abundance of scenarios. There is a designated individual responsible for the portrayal and execution of an image; the photographer. The sole person behind the camera lack the acknowledgement and appreciation they deserve. It is more common to respect the one being shot opposed to respecting the shooter. The person on the other side of the lens is too often disregarded and underappreciated. Blacklenses has taken this ideology to incredible lengths and is proving first hand why the shooters are entitled to their merit. The remarkable and gifted visual artist continues to make herself stand out above the many other accomplished talents in her field. She is going far beyond where your normal photographer would, as this month sparks the launch of the Respect The Shooter: Gallery Tour. The dedication and integrity that she holds is genuine, the entire tour is free for the supporters and is being funded independently. Go out and show some love the first stop is right at home in Phoenix, Arizona on June 8th. 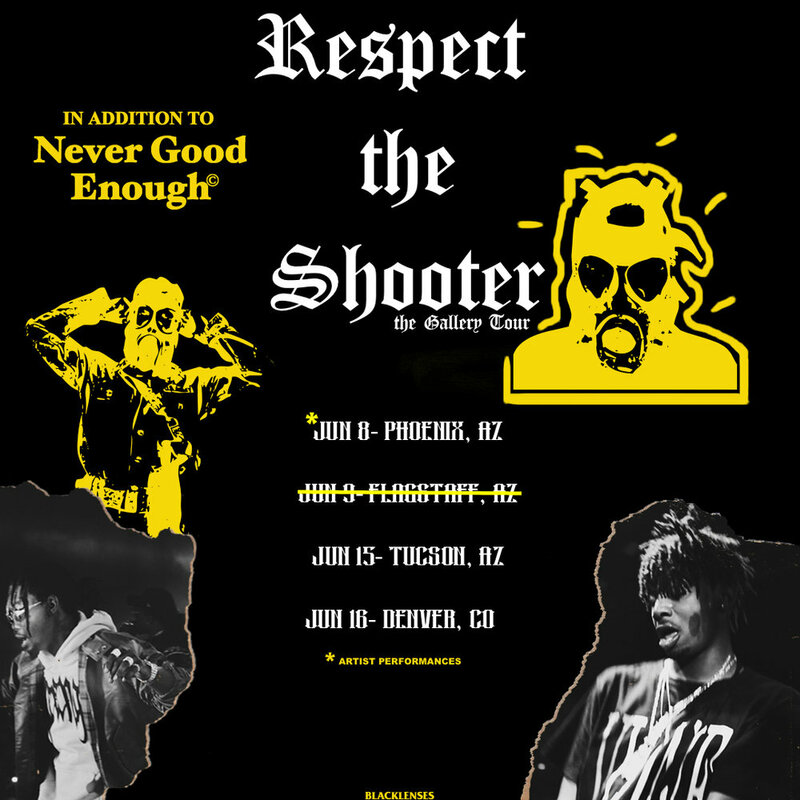 Make sure you're coming correct no matter where you are this Summer with Respect The Shooter attire. Throw on any R.T.S apparel and you'll be in full force to make something happen. For the people doing their thing on the daily out of the public eye and the ones already in the spotlight. Living in a world filled of those who claim the title of 'artist' , few and far between do we find those artist that capture us with their drawings and really make the mind wonder. Offering pure originality and pushing past the social norms are other keys into becoming a favorite in this art world. and a true artist that goes by PapaYoungVision, does just that. Coming out of Minneapolis Minnesota , PapaYoungVision is running this art world, literally! You can catch him on numerous occasions sprinting in photos. This movement he shows matches the vibrancy given off in all of his artwork. With his art, PapaYoungvision lets you in to parts of his mind when you look at the masterpieces he creates. His art is emotion provoking and sits calmly in a category of its own. When it comes to "expressionism" The artist has his own way of showing you how to feel. Providing a full range of colors, characters, emotions, and pure artistic excellence, PapaYoungVision is an artist that can't be denied. Check out more of his work here and try to catch up to Minnesota's running man. Marana, Arizona Vs. The World! In streetwear you really have to be doing something contrasting to stand out. The orginality and hustle of the brand both play huge roles in whether it will succeed or not. The 1-Off Project is one that is doing something nobody else is right now. They’re coming right out of north Tucson, Arizona from Marana too! The 1-Off Project is a brand like no other that is focused directly on making the wearer feel unique. There is no piece alike. every one is special in it’s own way. The creator of the movement, Billionairy, came up with the great idea to recycle shirts and turn them into something new that nobody has. We’ve all been to thrift shops before and know that you can find some crazy garments in there. Billionairy has gone above and beyond by not only finding them but creating something fresh as well. The concept of Last One Left ties with the idea that not a single shirt is the same. This brand is for the people, it makes them feel distinct based on the fact every product is 1 of 1! Just last weekend he had a 2-day pop-up at Nowadays Creative Lab in Tempe, Arizona. If you need to hold a pop shop in Phoenix or get anything printed, Nowadays is that spot! Billionairy was printing and spray painting shirts on site one by one for each person. That’s real effort to put in and emphasizes that he practices what he preaches. The only way to move is to be genuine and he’s got that down. Go check the Instagrams and get with the project! One of the most slept on brands coming out of Atlanta is Klan Life Clothing. They've been representing the Atlanta scene since 2014 and have stressed the importance of brotherhood. They strive to bring people together regardless of their differences and stand as an outlet for individuals to express themselves. The work this brand has put in does not go unnoticed, they built some strong relationships with some well recognized faces. Some examples are UnoTheActivist, Thouxanbanfauni, Swaghollywood, and Playboi Carti. These connections were all made at the beginning of all their careers and have stuck ever since. The brand itself is multifaceted, every drop holds something new and unique. They can produce everything from sweatsuits to custom flannels, don't doubt their abilities when it comes to fashion. The latest collection is called Playground Stories, that is what is currently up on their site. It consists of tees, sweats, hoodies, shorts, flannels. All worn by some of your favorite Atlanta artists. Klan Life is more than just a clothing brand they're in tune with music as much as they are clothes. The way they've made lasting relationships with artists is significantly shaping their image and pushing them to new limits. The fact that everything is organic and the cosigns they've gotten are genuine gives them that much extra of a boost as well. Stand up and join the movement today. GO SHOP THE PLAYGROUND STORIES COLLECTION BELOW! 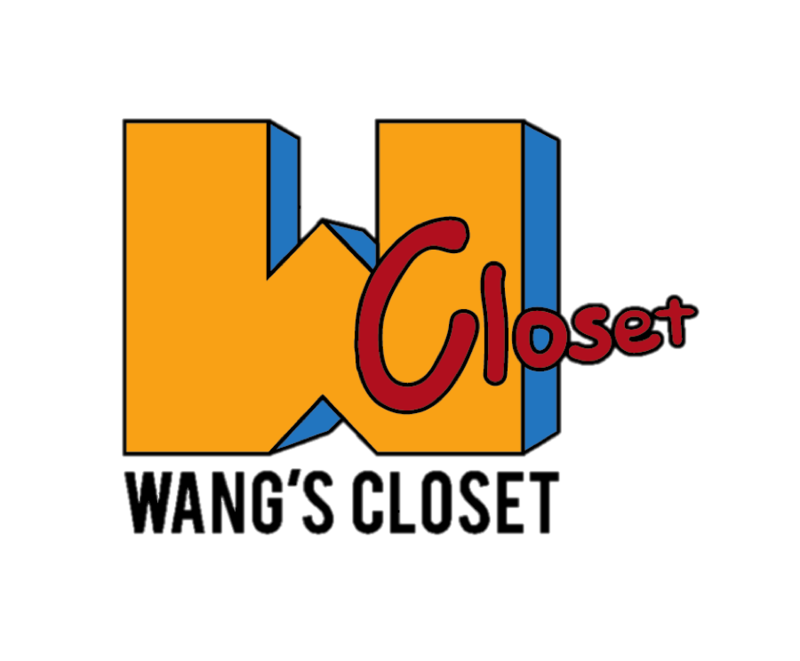 Wang's Closet is a Buy-Sell-Trade clothing store specializing in streetwear and vintage located in Tempe, Arizona. About a week ago I got to have an in-depth conversation with one of the owners, Justin. We had a great talk and he went over the general overview of how Wang's came to be what it is today. He masters in the business side of the store, while Nate (Wang) the other owner, works closely with the hustling of the clothes. Wang's Closet has only officially been open for a little over a year but they have covered an immense amount of ground already. It all started with the simple idea of flipping clothes and they ran a 100-yard dash with it. Starting with close to nothing, they had legitimately a closet size inventory. They had a small designated section in Nate's dad’s vintage store which they now own completely and remodeled to fit their aesthetic. As time went on Instagram became their biggest source for marketing. Their friend Anthony put consistent work in day in and day out posting pictures of the items for sale, boosting their following incredibly. Since then there has been no looking back and Wang's has taken over, becoming one of Phoenix's top spots for all your fashion necessities. The store’s layout is anybody who's into fashions dream. There are racks on top of racks of clothes ranging from vintage rap/band tees, Supreme, Bape, FTP, Palace, vintage jersey's, just about everything you could imagine. The back wall consists of all their shoes and they really have it all. Jordan's, Nike's, Yeezy's, Adidas, Revenge X Storm, that's only to name a few. The way that all of the employees carry themselves is respectable and the hustle that they all share is what has brought them this far. The whole staff keeps it real and truly tries to make a connection with the customers, they never give off the vibe that they're trying to pressure you into buying something. They treat the customers like friends and that's what it's all about. You feel at home when you enter Wang's like you just pulled up at your gang's house to kick it. Not to mention every employee is adept in the knowledge of what they're selling. Having this type of integrity is what separates a lasting movement from one that is short-lived. Wang's is coming nowhere near having a short life, this shop is here to stay. There's a lot of big things upcoming for the store, they continue to grow every single day. Expansion is inevitable at this point with the way everything has been moving. They'll always keep the Tempe store as headquarters but expect to see Wang's Closet in many different states in the coming years. Even if you don't live out in the Phoenix area you still can cop some garments from their web store below! Follow their Instagram too and see what pieces they're moving day to day! In a time where everybody is so hungry for visual content, there are few and far between who can actually deliver visuals that resonate with the audience. There is one in particular who's name is holding significant weight over the rest, he's made his way onto our pages consistently and is rightfully deserving of that. That man is Jon Psycho, his work has put him into an entirely new level than his peers. This creative piece is long overdue, we got to sit down and chop it up with him but never dove deeper into his work specifically like this. His videos are influenced heavily by horror but he's proven himself to be capable of tackling anything that crosses his path. There are many examples that set him apart from the rest, he pays an exceptional amount of attention to detail and if you openly invest yourself while viewing his shots you'll notice this. There's always a method to the madness, every shot has a reason behind it and is set up precisely how he forecasts. He's undeniably talented in that aspect, he has a vision every single time he picks up the camera and he executes perfectly. You can't put Psycho in a box, he does it all, with in everything he does he makes it a point that his audience will feel something. No matter what piece he's got in the works whether it's a music video, lifestyle video, or photography he always brings the heat. It's never anything less than a thrilling and lively experience for the viewers, he genuinely knows how to reach them. He never ceases to amaze us and continually inducts graphic imagery all across the board, regardless of the type of media. You're assured to have chills run down your spine and get goosebumps while observing his masterpieces. His track record of acts he's worked with include some noteworthy names as well. The list is long but some samples are ATL Smook, Drakeo The Ruler, Da$h, Thouxanbanfauni, and a whole lot more. We've already covered damn near everything thing he's got out but here's some of his work displaying his versatileness! WAIT A MINUTE! Y'all probably thought that was it, nah he still has more going for him. Aside from all the visual arts he just dropped off some insane merch for us! He's the definition of a creative, the way he carries himself and expresses himself through multiple forms of art is mind blowing. He keeps it simple yet effective only putting out a single design in black and white, it's up to you which one you're about to cop. Most people try to shift from their craft into something else but he proves he can do whatever he sets his mind to with this drop, that's a fact. Go grab that while you can, it's about to sell out ASAP! Psycho's really out here doing his thing.